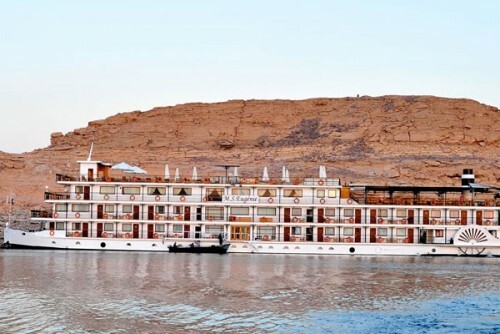 MS Eugenie Lake Nasser Cruise is the first ship to sail the artificial Lake Nasser, launched a new era of tourism, offering travelers very unique temples on the two sides of the Lake. M.S. Eugenie was constructed in 1993 in the style of a turn-of-the-century Nile steamship and last renovation was in June 2011. It’s just 52 cabins measure 21m2 and two luxurious suites ("Imperatrice Suite" measures 100m2 & De Maria suite" measures 42m2) 44 cabins & 2 suites with private balcony and 8 without located on the lower deck.